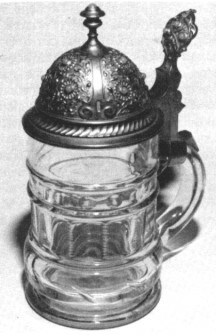 Figure 1: Late nineteenth century steins with "jeweled" lids were symbolic of early European superstitions that precious gems provided protection and good fortune. The amethyst was alleged to have the power to subdue the passions and repress drunkenness. Figure 2: The red ruby was regarded as a valuable and cherished jewel, and it was thought to have magical powers that restrained lust, drove off wicked spirits, and warned of the presence of poisons. 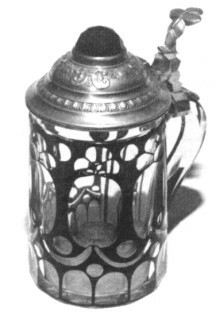 Figure 3: Decorating the lid and thumblift of this stein, the blue turquoise, when bestowed as a gift, was a token of love to a betrothed. The gem was reputed to change color if that love and affection were lost. A variety of glass steins from the latter quarter of the nineteenth century have colored glass "jewels" set in the pewter lids. The glass crystals are decorative ornaments, as well as symbols of early European mythology. Faceted crystals of purple, red, green or clear glass can be found on pewter lids of mold-blown and pressed glass, and to a lesser extent, on porcelain steins. European mythology gave special attention to the supposed magical powers of precious gem stones. Superstitions and omens surrounded amethyst, rubies, emeralds and diamonds, which covered them with a cloak of mystery that has continued for centuries – and even into the present time. 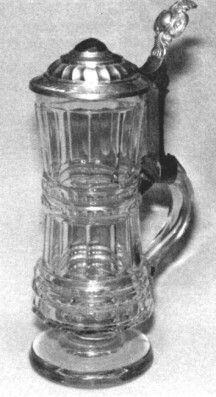 The crystal set in the lid of the cut lead glass stein shown in figure 1 had an appropriate connection to drinking. The deep purple color resembled the amethyst, which the ancient Europeans believed had the magical power to overcome drunkenness and drive it away. The ancients drank out of cups studded with the gems so that they might imbibe to excess but never to intoxication. The gem was also believed to repress evil thoughts of passion and create an atmosphere of calm and mental peace among friends and companions. The ruby-red colored crystal, shown in figure 2, resembles the red ruby gem which the ancients believed had the power to give warning of poisons. The jewel supposedly grew dark and cloudy when poison was near. The magical power of the ruby also gave notice of misfortune or danger, and when evil threatened, the gem turned black until the peril had passed. The ruby was considered a good luck charm that provided good health and a cheerful and clear mind, while it banished sadness and lust, as well as wicked spirits. A bright green crystal represented the green emerald, to which was attributed the special power of maintaining fidelity and faithfulness in lovers, only to lose its color when the trust had been betrayed and broken. The gem abolished evil spirits into the night, and strengthened friendships as well. A clear crystal represented the diamond, which was ascribed to have the power to make men courageous and victorious over one's enemies. It was thought to have great virtue when given freely and without coveting. The gem induced justice, innocence, faith and strength. The clear potash glass stein, shown in figure 3, has 16 blue turquoise colored glass beads set in the pewter lid and thumblift, which was also decorated with a gold finish. The blue turquoise was regarded as a love token when it was presented as a gift by a lover to his betrothed, and the color remained constant as long as the affection lasted. Crystals of purple, ruby red, and emerald green are the usual colors found in inlaid lids. Certainly there are other colors, in lesser quantities, and some should be considered as rather unusual. For example, a greenish yellow crystal set in the lid of an enameled pressed glass stein proved difficult to research. As it turned out, the crystal was symbolic of a gneiss type of quartz found on an island off the coast of Scotland. During the Dark Ages, talisman (charms) cut from the stone were believed to have the power to protect a person from all dangers of drowning. The belief in the myth continued, and it became a European superstition that endured into the 20th century. In relation to the stein, a rather subtle sense of humor must have surfaced. Was the drinker safe from drowning in a lake, or safe from drowning in his beer? Perhaps the message was a simple "enjoy your beer, there's no water here". Another version might have been "drink beer and avoid all water – it's dangerous." That precaution could apply to the present day as well. The superstitions explain the variety of colored crystals in inlaid lids on glass, porcelain, and stoneware steins, and also the colored stoneware jewels on the bases of some Villeroy & Boch steins as well. Also worth mentioning is the old European superstition of clinking glasses together after offering a toast. Originally, striking glass together was believed to be a gesture that drove the devil away from companions while they were drinking. The sharp clear ringing sound of the glasses most resembled the chime of a church bell, which was certain to rid the drinkers of Satan. Knocking on wood is another superstition that is in use to this day, and it originated with the ancient German tribes of Europe. It was believed that a pagan god who lived in oak trees harmed boasters, and knocking on wood appeased him. The ancients felt it was harmful to predict good fortune, but by immediately rapping on wood the braggart avoided any misfortune. Pewter acorn thumblifts should always be regarded as good luck charms, especially on wedding steins from the first half of the nineteenth century. The amulets were symbolic of fertility in the bride, and a long life together for the married couple. Acorns were also believed to bring good luck to the hunter, and can be found on steins of the latter quarter of the 19th century. For example, the Villeroy & Boch "Boar Hunt" stein has a pair of acorns for the thumblift, which meant double good luck in the hunt. The inlaid lid is also decorated with acorns and oak leaves. The oak tree was venerated by the ancient people who believed it was the first tree created, and symbolic of great strength and long life. These superstitions are just a few of the many that have been associated with drinking, love and honor over the centuries. Hopefully the explanation will provide more knowledge and a better understanding of steins. Precious Stones: For Curative Wear; and other Remedial Uses, William T. Fernie, MD. Originally published in England in 1907, reprinted in 1973. Falstaff's Complete Beer Book, Frederick Birmingham, 1970.